If you read my last post you would have seen that there are a couple of products that I wanted to try. One if the being NEOM's scented candles. I've seen them in lots of blogs and magazine and just had to try them out! Well now I can tick that off my " to buy list." I received a travel size candle and reed diffuser as part of a set last week. The scent I got in the diffuser was happiness. The smell is a sparkling blend of White Neroli, Mimosa and Lemon, combined with natural fresh grass notes to create the awakening of spring (perfect for this time of year). When I first opened it the smell was really strong,but now it's a subtle fragrance the fills the room, making the room smell clean and fresh and not a all overpowering. The scent I got in the candle was complete bliss, its a modern take on traditional Rose by adding a little Black Pepper and Lime so it really feels very fresh as well as traditionally beautiful. 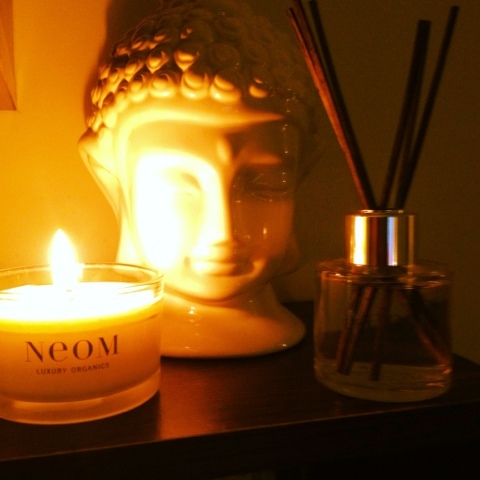 I'm yet to try Neom, I love candles - such a nice treat for the senses!